The new genus is one of the 31 microbial members found living inside two separate fracturing wells, Ohio State University researchers and their colleagues report in the Sept. 5 online edition of the journal Nature Microbiology. Almost all the microbes they found had been seen elsewhere before, and many likely came from the surface ponds that energy companies draw on to fill the wells. 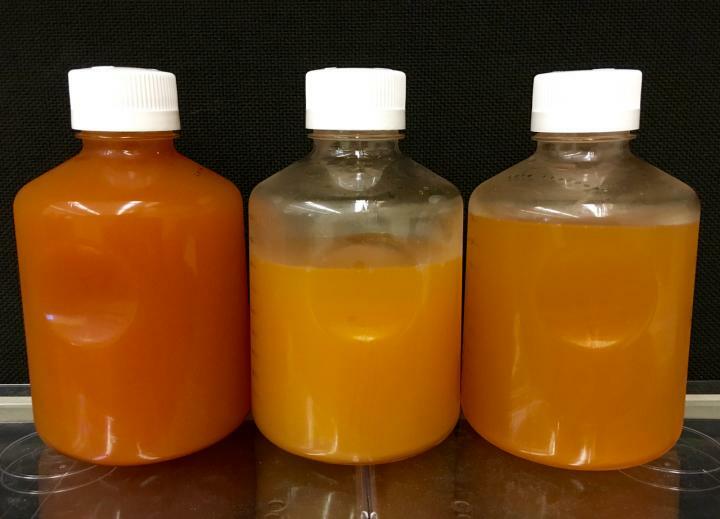 But that's not the case with the newly identified Candidatus Frackibacter, which may be unique to hydraulic fracturing sites, said Kelly Wrighton, assistant professor of microbiology and biophysics at Ohio State. In biological nomenclature, "Candidatus" indicates that a new organism is being studied for the first time using a genomic approach, not an isolated organism in a lab culture. The researchers chose to name the genus "Frackibacter" as a play on the word "fracking," shorthand for "hydraulic fracturing." By sampling fluids taken from the two wells over 328 days, the researchers reconstructed the genomes of bacteria and archaea living in the shale. To the researchers' surprise, both wells--one drilled in Utica shale and the other drilled in Marcellus shale--developed nearly identical microbial communities. Wrighton and her team are still not 100 percent sure of the microbes' origins. Some almost undoubtedly came from the ponds that provide water to the wells, she said. But other bacteria and archaea could have been living in the rock before drilling began, Candidatus Frackibacter among them. The microorganisms living in the shale must tolerate high temperature, pressure and salinity, but this study suggests that salinity is likely the most important stressor on the microbes' survival. Salinity forces the microbes to synthesize organic compounds called osmoprotectants to keep themselves from bursting. When the cells die, the osmoprotectants are released into the water, where other microbes can use them for protection themselves or eat them as food. In that way, salinity forced the microbes to generate a sustainable food source. To validate their findings from the field, the researchers grew the same microbes in the lab under similar conditions. The lab-grown microbes also produced osmoprotectants that were converted into methane--a confirmation that the researchers are on the right track to understanding what's happening inside the wells. One implication of the study is that methane produced by microbes living in shale wells could possibly supplement the wells' energy output. Page took 0.024217 seconds to load.